Do your nice shoes always have to hurt? I came across this question online in a shoe forum and the replies made me a bit sad. Most people were telling this poor woman “no pain no gain”, we sacrifice for beauty. I honestly and wholeheartedly disagree. The real answer to her question is no, Nice shoes don’t have to hurt you. With the proper fit and style for your specific foot, you can wear nice shoes all day! Let’s talk about the most important thing first, sizing. A study was done a few years ago that found about 90% of the women they interviewed admitted to have at least one pair of shoes in their closet that don’t fit and cause agony. 90% sounds extreme but I have to admit I was guilty once, before I found the light so to speak. Studies have also shown on average about 35% of woman do not know their true size and are wearing the wrong size all the time! Men’s numbers are a bit smaller than that but not by much. No wonder 75% of American will develop some sort of foot problems in their life, and woman are four times more likely than men. So many foot problems can be traced back to improper shoe sizes over the years, problems such as; bunions, hammer toes, neuromas and more! Getting sized every time is key to making sure your leaving the store with a shoes that don’t hurt your feet. People are amazed every day when they find out their feet have change over the years. As we lose and gain weight that can affect our foot size. 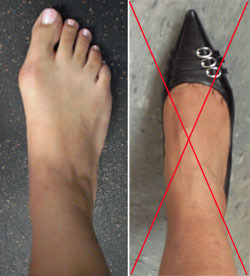 If our arches start to fall that will often cause the foot to gain a half size or more. After child birth, some woman can grow in foot size. We specialize in fitting your foot right every time, we also take into account the best types of shoes for you! Shoes, shoes, shoes! Some woman love them, some woman dread them. The trick is to find styles that work for you. Getting the right style for your foot type will make all the difference in your shoe buying experience. I often see women in search of dress shoe for work and they believe ballet flats are their only option. Opening your mind to trying different styles will help you on your journey. Instead of the ballet flat how about looking for a cute mary jane with a similar toe shape. The mary jane strap will help keep the shoe on and add more support while still offering you a “flatter” look. Shoes have evolved so much over the years with new technologies. Understanding foot problems also help us identify what’s best for you. Certain foot issues do better with various different shoes. For example a person with plantar fasciitis tend to do well with a neutral cushion running shoe as opposed to a walking shoe. Running shoes offer a higher lift in the heel that help relieve pressure on your heels and arches. They also providing more cushioning than a walking shoe. 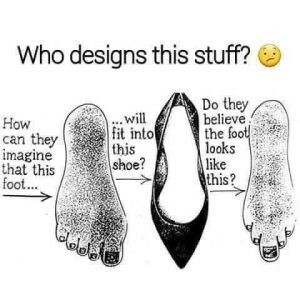 Usually things with a little heel work better than something that is flat for people with this issue. Shoes with wider, roomy, or stretchy toe boxes are great for people with hammer toes and bunions. Learning about all the shoes we carry is very important to us and is key to finding the right shoe for you! Identifying the cause of your foot pain can also really Change the way your shop for nice shoes won’t make your feet hurt!There are many factors that go into picking a great shoe that is not only comfortable, but wearable too! Carrying everything from cute dress heels to cozy slippers with support, it isn’t hard to find what your looking for. My main goal is always to educate and make your feet feel great! This is really great information you sharing with us. Awesome post and detail! Size really matters, the oversized or small always makes a situation of uncomfortability. Thanks for sharing this post, this is really very useful and worth reading.